Since we wanted a hassle-free trip this time, we booked a 3d2n package in Villa Juliana Inn, Caramoan, the cheapest I've seen so far. I have considered doing a DIY trip here, but the computation looks super close, so we opted to book the package. Our 3d2n package costs P3,500 per pax (minimum of 2 pax) and includes roundtrip transfers from Guijalo port, roundtrip transfers from inn to Bikal port, 2 days island hopping, 6 meals and accommodation. Our sundo, was promptly at the Guijalo port when we arrived. Do not expect an aircon van or car to fetch you from the port because in Caramoan, I swear I've only seen less than ten 4-wheeled vehicles during our 3-day stay, as the major means of transportation are pedicabs and motorcycles. From Guijalo port, it took us about 20 minutes to the Centro, where Villa Juliana Inn is. You will pass by some zigzag roads, of which some are still undeveloped. We arrived at the Villa Juliana Resort a little before 11:00 am. No one was at the reception area. So the pedicab driver called the owner, Kuya Roger. 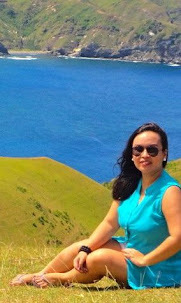 He then asked me if we wanted to go straight to island hopping or we want to hike towards Our Lady of Peace view deck. HIKE??? As in now? So you guessed it right, we chose island-hopping. Kuya Roger told us to eat lunch first then we will be brought to Bikal port, our jump off point to Caramoan Islands. So while waiting for our food, we went inside our room for a quick wash-up. This is the lounge area outside our room. And this is the dining area for guests. Very homey indeed. The bathroom is decent enough, though the water heater is not functioning. What's with the water heaters in CamSur??? Remember, the water heater at the Golden Leaf Hotel in Naga isn't working, too. And here comes our lunch! The serving is good for four, I guess. Two big chicken quarters, pork adobo, rice and pineapple. Yumyum!